Customer expectations are growing by the day; they are demanding faster and more flexible deliveries at minimum delivery costs. Businesses are being pressurized to customize their manufacturing processes as per customer demands. This is a hard slog for the logistics industry, which has to keep delivering better services but for lower prices. The logistics industry can only achieve this through ‘digital fitness’. It has to make intelligent use of the global wave of digitization, including data analytics, automation and ‘Physical Internet’. The Physical Internet is an open global logistics system that is transforming the way physical objects are handled, moved, stored and supplied. It aims towards the replacement of current logistical models and making global logistics more efficient and sustainable. The Physical Internet promises better standardization in logistics operations, including shipment sizes, labeling and systems. The central theme in logistics sector is collaborative working, which enables market leaders to retain dominance. 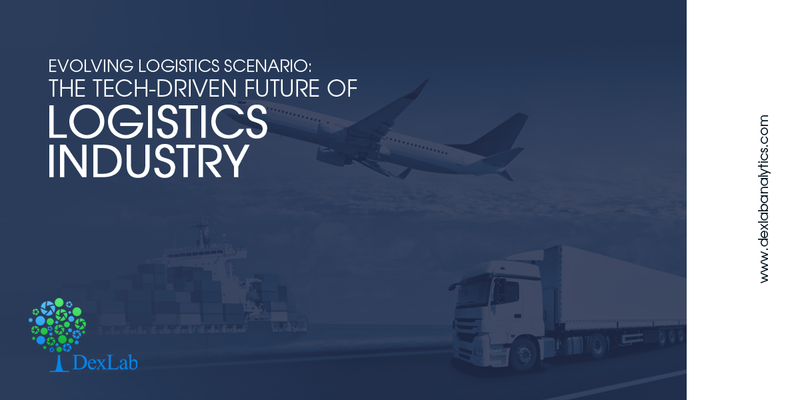 Now, let us take a look at a few tech-driven domains that will shape the future of logistics. Automate vital operations like inventory management and asset tracking: With the help of IoT, companies can improve tasks like tracking orders, determining what items need to be stocked up and how certain products are performing. Able to function without any human interventions. Enable the regulation of temperature and other environmental factors. IoT will be advantageous for the entire logistics sector, including fleet and warehouse management, and shipment and delivery of products. IoT can help companies dealing with cargo shipments by improving visibility in the delivery and tracking of cargo. Warehouse automation is set for a major overhaul. Online shopping is thriving and logistics, especially warehouse operations, need to be more refined and speedy. Warehouse operations of many e-commerce giants are undergoing a robotics makeover. According to reports, the market for logistics robotics, which had generated revenues worth 1.9 billion USD in 2016, is likely to generate sky-high revenues worth 22.4 billion USD this year. The advancements in robotics include programming robots to pick and pack goods, load and unload cargo and at times deliver goods too. Employing robots speed up the processes of data collection, maintaining records and managing inventories. Most importantly, robots leave no room for human errors in the processes. The growth of crypto-currencies like Bitcoin has popularized blockchain technology. Blockchain being a type of distributed ledger technology provides secure, traceable and transparent transactions. Blockchain technology employed by logistics firms will improve customer visibility into shipments and help prevent data breaches. In the present times, logistics is considered the backbone of a stable economy. Thus, for India to emerge as a superpower, the logistics market needs to be developed and integrated with state-of-the-art technologies. Conducive policies and a healthy partnership between private and public sector is crucial to steer India into an era of competent and cost-effective business operations. In times to come, automation will transform every industry. Don’t be left behind. Get an edge by enrolling for the data science and machine learning certification course at the premier data analyst training institute in Delhi– Dexlab Analytics.